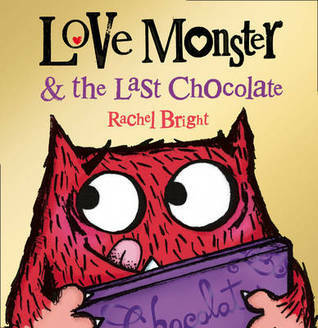 “A delicious new story about Love Monster, the only monster in Cutesville, from phenomenal, award-winning picture book talent Rachel Bright! This super-funny-rumbly-tummy-sherbert-explosion of a story shows that when faced with the selection box of life, following your heart will bring you the best treats of all”. Publisher. This cute story was my read aloud today for a Year 1 Class as a tie in to the weekend Valentine’s Day celebration. It’s sweet without being saccharine and has a welcome message about sharing with your friends. I love how the monster expresses feelings so familiar to children “…what if there aren’t enough chocolates for everyone, what if they take MY favourite?” As we talked about these and other things, little heads were nodding in agreement. The book almost looks like a chocolate with a metallic foil print on the cover. As I was reading it I was envisioning those strawberry flavoured, heart shaped chocolates one used to get in a box of Cadbury Roses. Yum! Written and illustrated by Rachel Bright. I picked up this copy from a Scholastic Book Fair – I must seek out the other two titles – I didn’t realise this was part of a series. #365PictureBooks Day 34 -Hooray for hat! “Elephant wakes up grumpy—until ding, dong! What’s in the surprise box at the front door? A hat! HOORAY FOR HAT! Elephant marches off to show Zebra, but Zebra is having a grumpy day, too—until Elephant shares his new hat and cheers up his friend. Off they march to show Turtle! The parade continues as every animal brightens the day of a grumpy friend. An irresistible celebration of friendship, sharing, and fabulous hats“. Publisher. When Elephant woke up, he was very grumpy…and so starts this lovely tale about gratefully and graciously receiving acts of kindness and paying the kindness forward. The author/illustrator is obviously an accomplished designer as the balance between the clever graphics and lots of white space on each page is perfect. 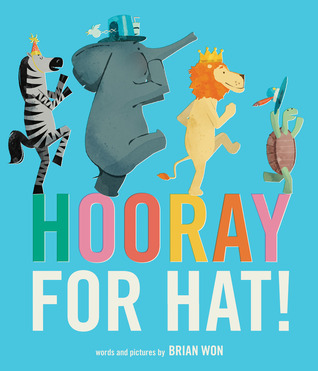 The colours of the exuberant hats and the corresponding “Hooray for Hat!” are in gorgeous colour in contrast to the more slightly more realistic and natural tones of the animals. The book is not sombre in tone – even the animals are crisply evident against the white. The book is a delight and has a freshness that is sure to charm anyone who has the pleasure of reading it. Hooray for hat! / Words and pictures by Brian Won. Published by Houghton Mifflin Harcourt, 2014. “One autumn day, a lion finds a wounded bird in his garden. With the departure of the bird’s flock, the lion decides that it’s up to him to care for the bird. He does and the two become fast friends. Nevertheless, the bird departs with his flock the following spring. What will become of Lion and what will become of their friendship? Publisher. This is a very quiet and understated tale of friendship, loss, the passing of the seasons and reunion. The book has some text but many of the pages are presented without words and the whole book would actually read beautifully as a wordless picture book. The calm and nurturing nature of the lion, as he nurses the bird back to health, is beautifully represented. The reader will feel the incredible heart -wrenching sadness and loneliness of the lion as he farewells the bird when he flies away in the spring. When the bird returns the following autumn when his flock are heading south you can’t help but rejoice with the lion. A beautiful book to share with reflective and sensitive children. This book makes you feel. brainpickings.org beautiful reproductions of the pages and a lovely reflective review of the book. Picturebookmakers.com read an interview with Marianne Dubac. 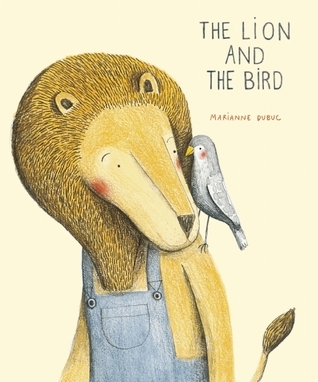 The lion and the bird / Written and illustrated by Marianne Dubuc, translated from the French by Claudia Z. Bedrick . Published by Enchanted Lion Books, 2013. 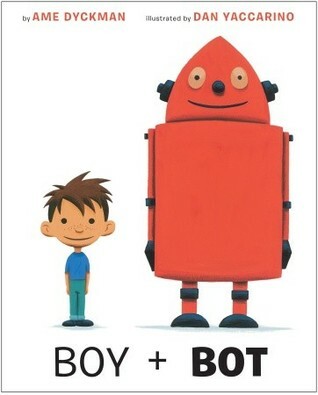 “One day, a boy and a robot meet in the woods. They play. They have fun. I love the universal message of friendship in this story. It is possible to be friends with people who are different. People are different in appearance, mannerisms, preferences and needs, but we all want and need to be loved. I love reading this to our kindergarteners. They get it. I love the illustrations that remind me of Little Golden books from when I was a child. They perfectly match the spare text – which says just enough – no more is needed. Should it be in a school library? Published by Random House, 2012. “Although he comes from a long line of archaeologists, Edward has never discovered anything. Then one rainy night, he stumbles upon what could be his first great discovery”. Publisher. When we meet Edward in the first pages of this book he appears rather small and possibly lonely. He is sitting looking at a picture wall of the photographs and portraits of his archaeologist relatives – all of whom, we are told, have made important discoveries. Edward has never discovered anything, despite digging holes in his large lawn (the picture of the swiss-cheese-like holes in his yard did remind me very much of Louis Sachar’s Holes). One night when rain has turned his dig to mud, he serendipitously trips and discovers a very large egg. Edward lovingly cares for the egg and very patiently waits for it to hatch. The bird becomes a friend and helps him with his explorations. When Edward reflects on the nature of his bird he wonders if there is something wrong with it – it can’t fly. Is his discovery broken? During a visit to a museum, Edward discovers exactly what kind of bird he has as a friend and realises that the bird is special, but that friendship is the great discovery. I recommend you peruse Celeste Hulme’s webpage to see a wonderful selection of pages from this book. I love the way the illustrator has used subtle vintage colours that perfectly match the antiquities and museum exhibits depicted on the pages. The end papers are also a delight with a fabulous gear list “Edward’s kit” – for little archaeologists! 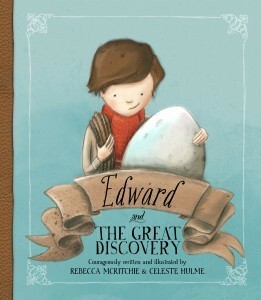 Edward and the great discovery / Courageously written and illustrated by Rebecca McRitchie and Celeste Hulme. Published by New Frontier Publishing, 2014. Available widely in independent bookstores. Surprisingly not in the Auckland Libraries catalogue. “Meet Brian, the invisible boy. Nobody ever seems to notice him or think to include him in their group, game, or birthday party . . . until, that is, a new kid comes to class. When Justin, the new boy, arrives, Brian is the first to make him feel welcome. And when Brian and Justin team up to work on a class project together, Brian finds a way to shine. I found my heart breaking a little when I read this book. Brian, is the invisible boy in this story. He is invisible because he is not even noticed by his classmates or teacher. The children who are noticed, are the loud, the demanding, the whining and the complaining children that seem to demand and get all the attention. Brian is flying ‘under the radar’. Brian’s invisibility is represented by his pale grey pencil drawn image on the pages when everyone else is drawn in colour. There are pages where we see Brian getting pleasure from his drawing and his images of dragons and superheroes are very revealing about his desire for friendship and acceptance. As Brian is introduced to another new boy a little colour fills his face and as he begins to make friends with Justin and collaborate with his peers he is gradually drawn using full colour too. This would be a wonderful book to share with students at the start of the school year or at any time when issues arise. It is a salient reminder for all the popular kids to see things from the POV of the quiet, the shy and the introverted. This book really reinforces the importance of kindness. Heartily recommended for all school libraries. 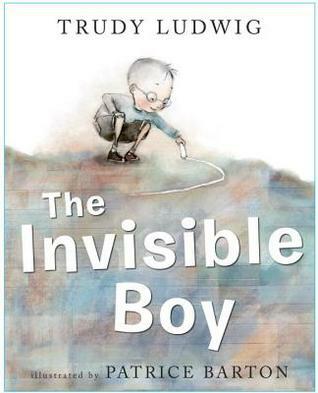 The invisible boy / by Trudy Ludwig ; illustrated by Patrice Barton. Published by Random House, 2013. This such a sweet story about friendship and the twist on the friendship theme in this book is that the imaginary friend is waiting to be imagined and loved by a real child. Every night he stood under the stars, hoping for his turn to be picked by a child and given a special name. He waited for many nights. But his turn never came. 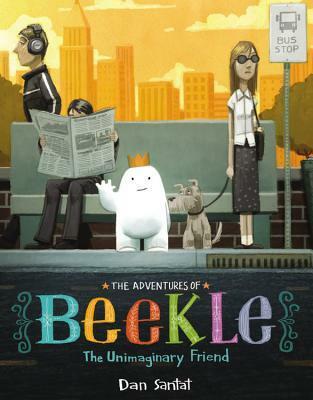 When Beekle sails away to the real world and ventures into the city, it is a rather dark, dingy and unhappy place, very much like the scenes in Mike Curatos Little Elliot, big city. The adults seem preoccupied and disinterested in everything around them and the only creature that notices Beekle, is a small dog and the reader. When Beekle catches sight of one of his imaginary friends from the island, then we see a burst of colour on the right hand side of a dark page. The subsequent pages are filled with colour and activity when Beekle finds a playground. Just when we feel that Beekle is at his saddest and loneliest, he finally meets his real friend. The reader can’t help but feel very happy for Beekle, especially when we finally see him smile.. I think this book would rather heartening to hear if you were a small person, perhaps at school without a special friend yet. And these lines might convince a child that becoming best friends with someone isn’t always instant or ‘love at first sight’. At first they weren’t sure what to do. Neither of them had made a friend before. the realised they were perfect together. Available from independent book stores, library suppliers and to borrow from Auckland Libraries. The imaginary / Written by A.F. 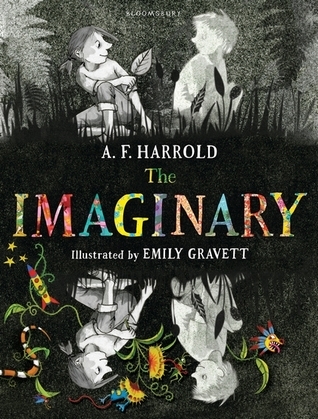 Harrold and Illustrated by Emily Gravett.